With our knowledge and experience we can help you stay compliant to both	OSHA and NFPA standards. 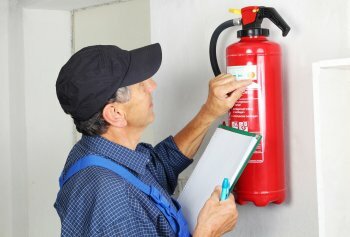 Our state certified extinguisher technicians	can review your facility making sure you have the right extinguisher in	the right location. We inspect, service, test and repair all manufacturers	and classifications of hand portable fire extinguishers and are also equipped	to meet your entire exit and egress lighting needs.